"[Metal Gear Solid V] won't be a game where you can spend an entire day fishing with Snake." Metal Gear Solid V is the latest game to jump on the open world bandwagon, and series creator Hideo Kojima has recently detailed to Japanese magazine Famitsu about just how "open" MGS V's world will be, and the reason the dev team decided to go down this path. Basically, the developers are sick of being tied down into always making "infiltration" missions, and wanted to allow players more freedom to tackle missions as they saw fit. 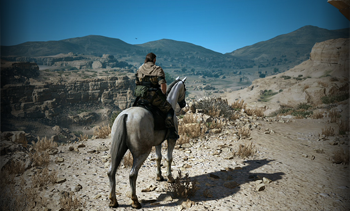 "The term 'open world' is often misunderstood by people," says Kojima. "[Metal Gear Solid V] won't be a game where you can spend an entire day fishing with Snake, or one that allows him to change his career in order to start a new life, or anything like that." Bad news for those of us who were expecting some kind of secret mini-game where Snake opens up his own bait-and-tackle shop. "Up until now, we've mainly only been able to make infiltration [missions] for Metal Gear Solid," continues Kojima. "There would be a demo scene that showed how to get there, and the players would start right in front of the entrance. If they safely cleared the mission, there'd be another cut-scene, where you'd see something like a helicopter appear, as you made your escape." He says that while being "on a rail" is fine, they wanted to mix things up for this game, both during and between missions. "Not just during the missions, but we want the before and after to also be similar to an 'information-gathering style of play'," he emphasizes. "For this reason, we've come to the conclusion that having an open world would be most ideal. The maps are wide, and the time and weather will also be changing." "You can compare it to making a survival game," Kojima cocludes. "While it is fun to shoot in survival games, it's also fun to split into teams and think about ways to overcome enemies and strategize."